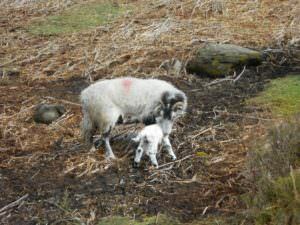 Chicks aren’t the only young that are out and about on the North Yorkshire Moors at this time of year, here we have a Swaledale sheep and newborn lamb on Bransdale Moor. 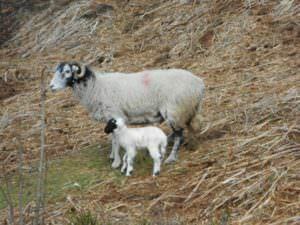 Sheep are invaluable to the moors as alongside best practice burning and mowing their sympathetic grazing assists in the control of the vegetarian growth, the sheep also play a major part in tick control as they act as “tick mops”. Ticks are very harmful insects and if they infect ground nesting birds treatment is impossible, however in sheep they can be dealt with. The “mopping up” of ticks by sheep also helps to lower the risks to human visitors and their canine friends from Lyme disease when out walking on the moors. Lyme disease is a bacterial infection spread by infected ticks, it can usually be treated effectively if it’s detected early on, but if it’s not treated or treatment is delayed, there’s a risk it could develop severe and long-lasting symptoms. This is another good reason why walkers should always keep their dogs on leads.